I am putting together the history of the Lewis Football Cup Competition which was based in the Attercliffe/Carbrook area of Sheffield during the period 1892 to 1903. A new cup was presented to the competition by Walter Wragg of 555 Attercliffe Road in 1903, hence the name change to the Wragg Football League, and that cup is still being played for today. I know there were 2 Lewis Cups used for the football competition in that period, the first being won outright by Baldwin Street Meths or Carbrook Church and the second by Nelson in 1903. I would love to find either of these cups. So has anybody any suggestions of who or what business was Lewis that the competitions were named after. I assume it must have had some local connections or was it something to do with bikes?, but at this stage I have not been able to trace anything. Also, has anybody any information or photos of Walter Wragg and his cycle shop at 555, Attercliffe Road. I am also looking for information on the Carbrook Challenge Football Cup which ran between 1883 and 1891. This stopped in 1891 when Carbrook Church won in outright. You already have this reference I take it? Wragg, Walter (, Cycle & motor manufacturer &c.). Residing at 555 Attercliffe Road, works Effingham Road, in 1905. 1892-This was the year of formation but the original name is somewhat obscure as the review of the early records concerning local Football refers to midweek K.O.Competitions,rather than a League in its own right,which was formed by clubs from other League's being invited to take part on a straightforward knock-out basis. There is also the existence of an "Attercliffe Liscensed Victuallers League" up until the turn of the Century and it is felt that this was the forerunner of the Wragg League. However,the League flourished along with many others as Football grew in popularity in this region allied,I suspect,to the sucess of both United and Wednesday during the late 1890's and early 1900's. Evidence to support the theory that the Wragg League was preceded by the Attercliffe Licensed Victuallers league was given by J.Bennison,a former member of the S & H C.F.A,who held a Winners Medal won by his father whilst playing for a team in 1902 in this League and went on to play in the Wragg league as it then became known in 1904. 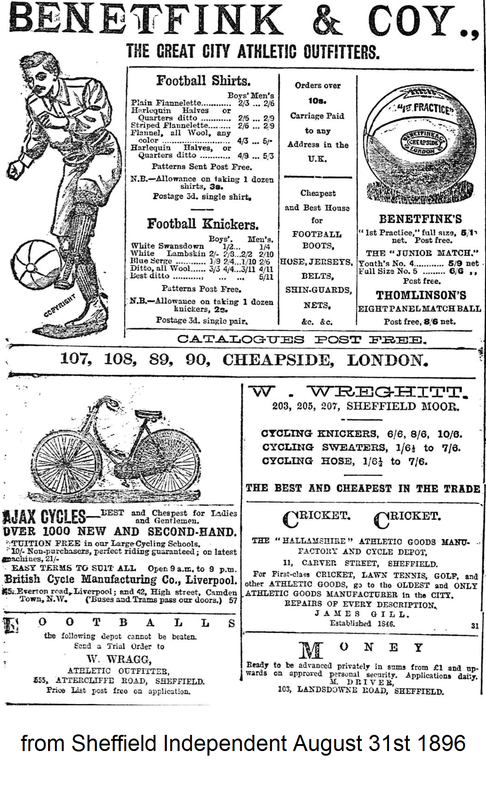 1904-This was the year that the present Trophy for clubs winning the League's top division was donated by "Wragg Cycles of Darnall" and although showing signs of 'wear and tear' is a splendidly crafted Cup and an inspiring Trophy for all teams in our Premier division strive for as they start the Season in search of honours. 1986- With the close of Season 1985/86 fast approaching and only 9 teams taking part in one division,and several of these indicating they probably would not enter the following Season,Committee members met during February to May to discuss the way forward for the League. No dates given, Walter Wragg Ltd., Motor Car, Motor Cycle Agent, picturesheffield. Mr.R Lewis’s One Mile Challenge Cup. George Littlewood (the champion long-distance pedestrian) will match Harry Darrin, of Sheffield, to run W.Cummings over a distance of one mile , for £25 aside and Mr.R Lewis’s Challenge Cup. £5 is deposited with the Sporting Life. The race is to be decided on Saturday, September 14, on any fair track in England. May we see it please ? I have a press advertisment from 1903 asking for teams to enter the Wragg league competition, and to contact W Wragg to do so. This advert clearley shows that this competition was formley the Lewis Cup and that Nelson FC had kept the previous cup as they had won in 3 years in a row, hence the need for a new cup which W Wragg donated. Carbrook and Carbrook Reform met on 24th November 1883 in the first round of the Carbrook Challenge, and the match was won by Reform, the score being 5:1. Carbrook were one man short due to an accident just before half time. The last match in the first round was between Attercliffe Juniors and Ellesmere Juniors and was won by Attercliffe 2:1. On 19th January 1884, in the second round, Willey & Sons played Carbrook Free Church at the Carbrook Cricket ground, which ended in a one all tie, though Willey and Sons had one goal disallowed. On 27th January Bethel United played Darnall, Bethel easily winning by 4 to nil. On 8th March the semi-final was played at Carbrook between Bethel and Norfolk Bridge Works, Bethel winning 2 goals to one. The final was played on March 22nd between Carbrook Bethel and Carbrook Reform, and the gate money taken was £12. Bethel took an easy victory.